I was given tickets to see this show by the kind people at ACMN. All opinions are my own. If you love the music of Michael Jackson, you will love Thriller Live. It is full to the brim with his music, and the music is executed brilliantly. The band were fantastic and if you closed your eyes, you could almost believe you were at an actual MJ concert. Standouts for me were MiG Ayesa and Prinnie Stevens. There were some very talented dancers in the cast, but as a group, the dancing was a bit sloppy. My untrained eye could see where they were supposed to be in sync, but just... weren't. It was also disappointing that during the number where they were using the screen to make it look like the stage was filled with Michael's that the vision was out of time with the audio. There's an attempt to convey some of his life story, but for me those parts were weird. Aside from telling me how many Grammy's he won (Spoiler alert - It's a LOT), they didn't tell me a lot about his life, And they did so in a very strange mish mash of accents. Pick one and stick to it, people! I really would have liked to see them use the huge screens to show us some archival footage too. I thought the forced audience participation was a bit desperate and it went on for toooo long. I did freak my husband out towards the end because I know all the words to the rap in 'Black and White'. I loved the costumes. So bright, so shiny! I'm not sure how they had time to do some of the changes they did. Having said that, I thought the costumes for the actual Thriller song could have been amazing but for me they missed the mark. I'm not sure what I expected Thriller Live to be, but what I saw wasn't it. I'm not sure if I can recommend you spend your hard-earned money on seeing this, especially when there are so many great things on in Melbourne at the moment that DO deserve your cash. I'm also guessing that I'm in the minority, given that this show has been on the West End and touring around the world for years. Maybe I needed to be a bigger MJ fan in the first place? 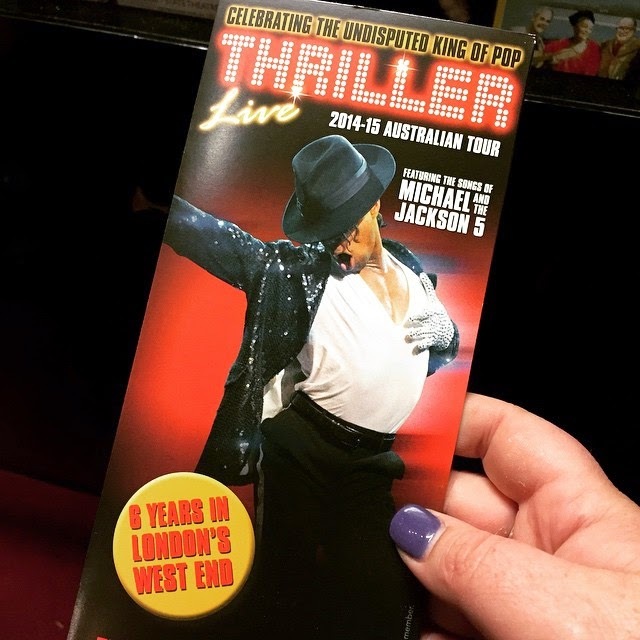 All the details for Thriller Live can be found by clicking here. It's currently in Melbourne and will be in Sydney and Auckland soon. Tickets in Melbourne are $65-$125.